Sound familiar? Do you have a “friendly bear” in your neighbourhood? Many of us assume that the so called “problem bear” is the one that behaves aggressively or raids garbage bins; but what about the bear that strolls quietly by you in the evening or appears to have no reaction if you discover him in your backyard. Is this acceptable? No! Not at all! Bears that do not react to human presence are habituated. Habituation occurs when the bear is repeatedly exposed to a situation where there is neither positive nor negative stimulus (Herrero et al. 2005). It simply gets used to having humans around, a sign that the bear is abandoning its natural fear of humans and is at high risk for becoming food conditioned. If it does not outwardly fear humans, it may become bold enough to raid garbage cans, pet food left outside or even attempt to enter a residence in search of food. Furthermore, it is impossible to predict a wild animal’s behaviour and a bear that, even for years, seems to tolerate humans may suddenly feel threatened or defensive resulting in a risk to human safety or damage to private property. While good intentions may be behind being “nice” to the bear in your yard, even if it is not after non-natural food sources, can lead to further problems in the future. Bears should be taught to regard humans and residential areas as things and places to be avoided. If these “friendly bears” continue to move away from natural behaviour the ecological impact could be strongly affected such as wild bear populations decreasing and a shorter life expectancy for urban bears. 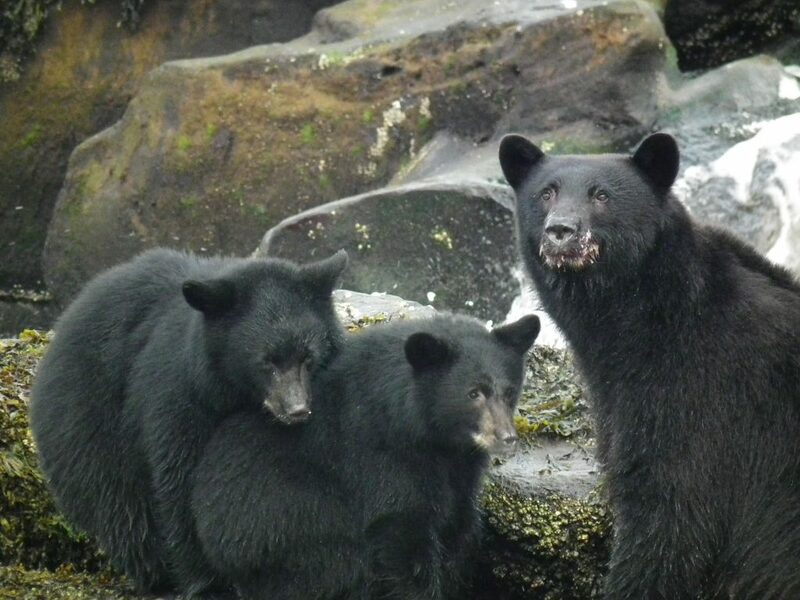 Depending on the level of habituation or food conditioned behaviour, bears may respond well to negative conditioning and may reinstate their natural desire to avoid humans and all things related to humans. Should you see a bear in your backyard, first ensure that you are in a safe place and that all pets and children are in the house – then make a racket! Shout at the bear or blast an air horn, bang pots and pans together – use a slingshot with marbles or anything to startle the bear and send him or her packing back to the woods. You are not harming the bear; you are helping it and your actions do make a difference! You play a key role in preventing bear-human conflict in the future! Remember….the moment a bear enters your community wildlife management begins, and each and every resident becomes a “wildlife manager” (McMillan, 2009).